Did you know QPL also prints large format items? From table top displays to trade show booths and event tents QPL can handle all your promotional printing needs. For some great promotional ideas, download our large format catalog. 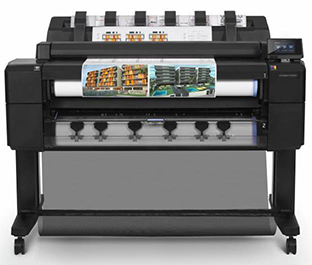 We are proud to announce the addition of the new HP Designjet to our equipment list! For our customers who need to print posters, maps, technical drawings, engineering prints and renders, this new piece of equipment will allow us to offer a quicker turnaround time with high quality results! We can also scan your large documents and save them as a PDF. QPL prides itself in providing the best quality products to our customers, and we have upgraded to this large format printer to continue to offer you the best service. Whether you need large format, digital or off-set printing, we have the capabilities to meet the needs of our customers and we look forward to assisting you on your next project! 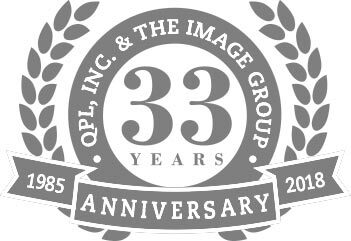 QPL, Inc. & The Image Group has been one of Massachusetts’ leading commercial printing companies for over 30 years. Since 1985 we have provided our clients with high quality printing, innovative technology, and unparalleled service. Our clients range from small businesses to Fortune 500 companies. Their diverse printing needs range from annual reports to advertising and marketing materials. We can meet the simplest or most complex printing requirements and have the resources to take a project from inception to delivery -- with cost-effectiveness and time efficiency. You can rely on QPL, Inc. & The Image Group for our range of services including: on-demand and large format printing, desktop publishing, promotional products, mailing services, product photography and more. We are the area's most experienced printer providing a solution for EVERY challenge! We've won various awards from both the Printing Industries of New England and The Boston Litho & Craftsman’s Club for our design and printing excellence. Let us help your business be a winner too! Take a look at our clothing catalog. We can customize any way you like. From silk screening to embroidery, we got you covered! QPL is committed to the practice of responsible and sustainable printing. From our numerous certifications to wind powered energy, QPL & The Image Group remains on the cutting edge of the Green Movement. For the past few years the owners of QPL have been participants in a wonderful 3 day motorcycle event through the mountains of Vermont. 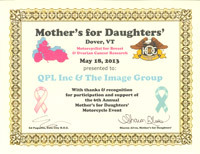 The Mother's for Daughters' Motorcycle Event for Breast and Ovarian Cancer Research is very close to them. As a two time Breast Cancer Survivor, it is important to Maxine that she supports this great organization. For the second year in a row, QPL has received special recognition for their support.